WE SUPPORT OUR TROOPS AND COUNTRY. THE ARTIST - Don Troiani DON TROIANI is a soul lost in time; a twentieth century artist to whom the life of the common soldier of the Civil War through the mid Eighteenth Century is as familiar and vivid as the surroundings of his Connecticut studio. While there are many other painters who have turned their attention to historical art, none have done so with the enthusiasm, insight and dedication of this accomplished recorder of drama and detail. In the spirit of presenting historical truth through art, Don Troiani has personally set uncompromising standards of excellence and authenticity in his field that few others can equal. Models are chosen with the greatest care to achieve the proper look of the men in Colonial and Victorian America. The garb and gear of each figure are painstakingly researched. Appropriate backgrounds are found and studied, sometimes sending the artist hundreds of miles from home to examine battlefields and structures firsthand. Because of the great amount of research that goes into one of his works, it is often years between a painting's conception and the actual moment the brush is put to canvas. "If an historical painting is not reasonably accurate, then it's worthless both as art and as a historical document, " Troiani declares. If you are going to become involved in this field then there is little excuse for a pattern of inaccuracies. Indeed, Troiani's lifelong focus on America's military heritage enables him to present that subject with a credibility that surpasses his contemporaries. For a quarter century he has methodically built one of the great private artifact collections of Civil War, 1812 and Revolutionary War, World War II uniforms, equipage, insignia and weapons which he calls on to add the unique dimension of realism he is so well known for. An expert researcher with a personal Military library of over 2,500 volumes, he is assisted in his search for the truth by a select network of advanced collectors, curators and historians whom he corresponds with regularly and who open their own collections to him. Hollywood has enlisted him as consultant on "Civil War Uniforms and Equipage" for the acclaimed feature film "Cold Mountain" starring Nicole Kidman, Rene Zellweger and Jude Law for which he received screen credit. Also in Cold Mountain, The Journey from book to film. " Troiani has also been military advisor(and made appearances) on the A&E and History Channel's "Civil Journal" and the miniseries "The American Revolution. Televison appearances on "Missing Reward", "Incurable Collector", and "Hunt for Amazing Treasures" are among his credits. "37th New York Volunteers, Irish Rifles" Don Troiani S/N Limited Edition Canvas Giclee. #19 in the Regimental Series. The color bearer of the Irish Rifles waves the distinctive green silk with gold embroidery Irish flag of the regiment. All Limited Edition prints are signed and numbered (S/N) by the artist and include a Certificate of Authenticity. Limited Edition prints are restricted to a certain number. For example, if 400 prints are made from an original painting, once theyre gone, thats it. There is no limit to the number of open edition prints of a particular painting. Thats why Limited Edition prints are more expensive and more valuable to collectors than "open" edition. Rare objects are more valuable. An Artists Proof (AP), generally, is the first 10% of the Limited Edition prints that come off the press. If the Limited Edition is 400 s/n, there would be 40 APs. This status is noted on the print. Collectors prefer APs because their value increases even more than a Limited Edition as time goes by. A remarque is a pencil drawing done in the white border area of an art print. The subject of the remarque is usually determined by the artist. Each remarque is a piece of original art which adds to the value of the print by making that particular print unique and exclusive from the rest of the prints in the edition. All Limited Edition artwork is subject to availability at time of order. 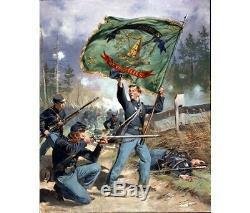 The item "37th New York Volunteers, Irish Rifles Civil War Canvas Giclee by Don Troiani" is in sale since Saturday, October 25, 2014. This item is in the category "Art\Art Prints". The seller is "airplanesandmore" and is located in Flower Mound, Texas. This item can be shipped worldwide.